I made muffins for breakfast this morning. These are (again) from the Breakfast chapter in Nigella's Feast. She actually suggests using store-bought granola in the muffins for ease, but I always have huge quantities of homemade granola at home (also from the Breakfast chapter in Feast), so why not? I also followed Nigella's ease-making suggestion of measuring out the ingredients the night before, so that when I woke up, all I had to do was turn on the oven, lightly mix the ingredients together and bake them. They have a heavenly aroma, the cinnamon in the granola wafting through the house as they bake. They're soft on the bottom, crunchy on the top and thoroughly delicious. Mmmm.... 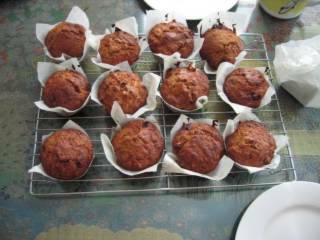 These muffins "with their buttermilk-lightened crumb and dried fruit and nut filling, are just what you want your morning muffin to be". Before making these, I had fretted and worried about how we were going to finish them (the recipe makes 12), and asked around for advice on freezing and defrosting baked goods. Hah. How unnecessary. 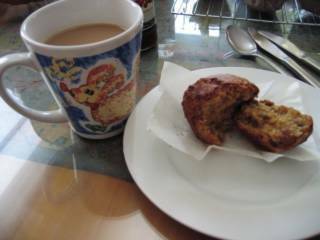 We had two each this morning, I had one for afternoon tea and Mum had one for supper. So there are two left, and you can bet your bottom dollar they'll be eaten before they have a chance to go stale.